While most people will agree that the first Fantastic Beasts film isn’t quite on the same level as the Harry Potter films that came before it, it was still a lot of fun and a great start to a new adventure. Today we are learning a little more about the next chapter in that adventure as the synopsis, title, and cast photo for the sequel have been released. 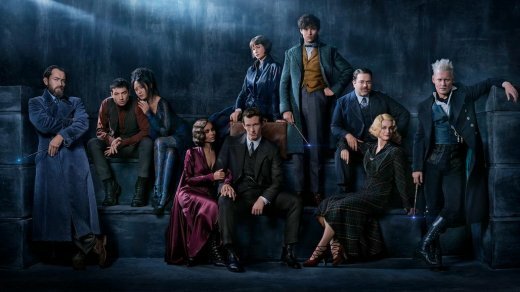 The sequel to the film is now officially titled Fantastic Beasts: The Crimes of Grindelwald. While most of the faces in the new film will be familiar to you, the most exciting cast addition to the film has got to be Jude Law as a young Albus Dumbledore. Joining him in the film are: Eddie Redmayne, Katherine Waterston, Dan Fogler, Alison Sudol, Ezra Miller, Zoe Kravitz, Callum Turner, Claudia Kim, Johnny Depp, and Jude Law.